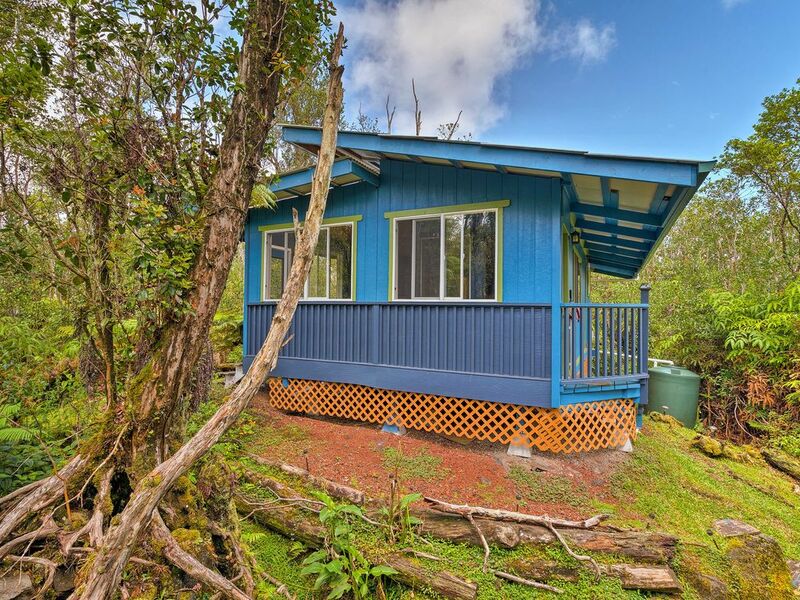 Get off the grid at this secluded 1-bed, 1-bath Volcano vacation rental cottage! Tucked in a native Hawaiian rainforest near Volcano and Mountain View, 'Honu Hale' includes sleeping for 4, plus a yoga studio on site with mats, blocks, chairs & straps. Spend your days practicing yoga, or hop on The Hele-On Bus to travel around the island. Hilo and Hawaii Volcanoes National Park are nearby! Cruise along the less-traveled roads of Fern Forest and Mountain View to discover your hidden haven! The cottage is powered by solar and propane energy, which is sustainably conserved by turning it off when not in use. Lush greenery surrounds this delightful dwelling, making its vibrant blue and green exterior pop! Step inside, where you'll find a wealth of windows revealing the beautiful tropical rainforest outside. During downtime, read your favorite book from the futon or head to the yoga studio on site to find your inner zen! When you get hungry, create a delicious meal in the well-equipped kitchen, complete with modern appliances and several cooking necessities. When night falls, take a relaxing rinse in the shower/tub combo before heading to bed. The bedroom features a cozy queen-sized bed and fresh linens, offering a comfortable space to get an energizing night's sleep! The cottage's terrific location between Hilo and Hawaii Volcanoes National Park makes it easy to access several area attractions. The Hele-On Bus, the area's public transportation system, will pick you up at the top of the subdivision and can take you all over the island! If you choose to head west, you'll hit Hawaii Volcanoes National Park with the iconic Kilauea active volcano, Sulphur Banks, and Nāhuku - Thurston Lava Tube. You can also explore the area through a tour group, some of which include Kazumura Cave Tours, Kilauea EcoGuides, and Epic Lava Tours. Don't worry - the national park reopened on September 22, 2018, and is safe for visitors! Venture northeast to find Hilo brimming with attractions like the Liliuokalani Gardens, Mauna Loa Observatory, and Imiloa Astronomy Center. From here you can also book everything from helicopter tours to ocean excursions! To stay close to the property, take a 15-minute drive to the Akatsuka Orchid Gardens or head to the Hilo Coffee Mill for a tour. A day trip to the east coast will take you to Lava Tree State Park, the Kapoho Tide Pools, and Isaac Hale Park. - Amenities include a well-equipped kitchen, free WiFi, solar power energy, linens, towels, a full bathroom, queen-sized bed, carport parking, and more! - Access to a shared yoga studio stocked with mats, blocks, chairs, and straps! - Quiet Volcano location - Minutes from Hawaii Volcanoes National Park, Hilo's many attractions, tours, and beaches!